careless use of paint. The engine may look good but most paints act as an insulator and hold in heat. In addition to keeping the cooling components clean, you must inspect them each time the engine is serviced. Replace or repair any broken or bent parts. Check the fins for cracks or breaks. When cracks extend into the combustion chamber area, the cylinder barrel must be replaced. Now that we have studied the simplest method of cooling, let's look at the most common, but also the most complex system. Nearly all multicylinder engines used in automotive, construction, and material-handling equipment use a liquid-cooled system. Any liquid used in this type of system is called a COOLANT. 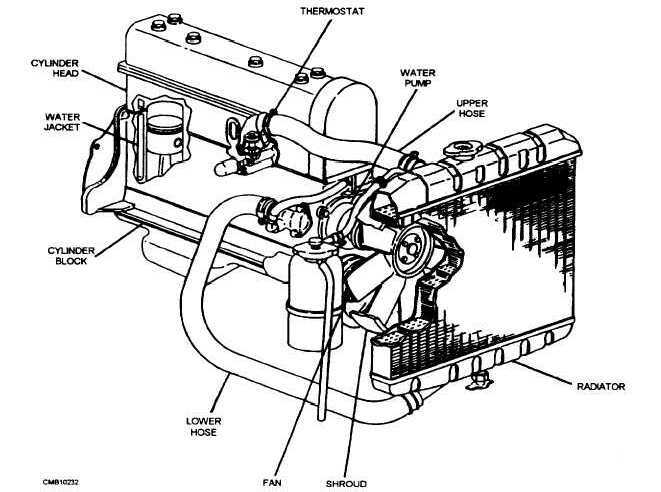 The pump draws the coolant from the bottom of the radiator, forcing the coolant through the water jackets and passages, and ejects it into the upper radiator tank. The coolant then passes through a set of tubes to the bottom of the radiator from which the cooling cycle begins. The radiator is situated in front of a fan that is driven either by the water pump or an electric motor. The fan ensures an airflow through the radiator at times when there is no vehicle motion. Figure 6-4. - Liquid-cooled engine.